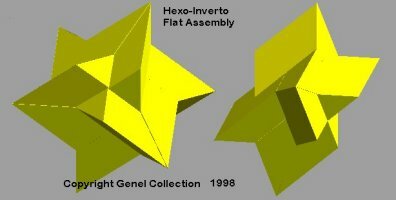 The Hexo-Inverto is a star form of a well known Diagonal Star. 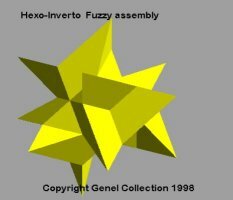 Hexo-Inverto is one of the most unusual puzzles. It assembles in three different shapes: Long, Flat and Chaotic. In Chaotic form it reveals internal surfaces which are hidden in Long and Short forms. That's why we can say: Hexo-Inverto is an Inside-Out puzzle. Hexo-Inverto has a hollow cube shaped cavity inside of it, so to some extent it's a Box Puzzle.